The idea of riding with your biker lover and finding the perfect place to watch a sunrise may seem like a bit of work, especially if you’re not a regular morning person, but it can certainly be worth the effort once you find the your special place. 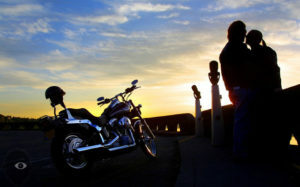 Start by riding with your special motorcycle man or biker woman around the town or region in which you or your biker match live, looking for potential spots, or discussing the possibilities over a late dinner. Once you’ve decided on a few possibilities, choose one and drive there so you can arrive just before the sun rises over the horizon. If the sight isn’t as breath-taking as you would have hoped, don’t worry- there are other possibilities, and half the fun is trying to find the perfect sunrise view. After the sunrise, feel free to check out a local restaurant for breakfast or see if you can bring a small snack along in your saddlebags or bring a back pack picnic. It can truly be a great way to start your day, and can be a great reason to become a morning person at least for a few days. As you can imagine, this idea can turn into a multiple date activity, and searching for the perfect sunrise in your area can become a grand adventure in a way. Just be careful not to overdo it. There are plenty of other activities to do, and plenty of time to follow your quest for the best sunrise. The best thing to do is to search for the sunrise when the mood hits you, and the weather allows for the best viewing. Also remember that not everyone is a morning person, so don’t be afraid to change your sunrise search to a sunset search instead.